As parents, we’re always looking for the right balance of amusements for our kids. There’s only a certain amount of frivolous fun toys we can supply for them, and those definitely have a rightful place in our home. The thing is, today’s world is about so much more than the ying/yang of fun and work. That’s why we’re so interested in Sphero, because Sphero learning toys help make kids smarter through play. Learning does not have to be work. Sphero is one company that has figured that out, creating cool devices that are both fun and educational. Yes, a lot of toy makers say that – and have been since back in the day. In our home, Sphero’s high-tech consumer robots brought this to another level. 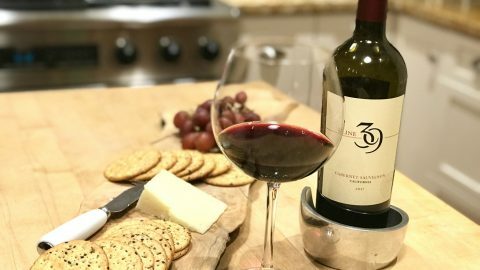 The whole family is in on the fun. Plus, while our kids are playing with Sphero BOLT and Sphero Mini, the robots are supporting their STEAM learning. (STEAM stands for Science, Technology, Engineering, Arts and Math). When we were asked to review the Sphero BOLT and Sphero Mini, our answer was an immediate yes. Admittedly that yes came from me, largely because I was so intrigued by the ingenuity of this technology. When the delivery arrived, I unpacked the contents like an eager kid on Christmas morning. I could not wait to get that package open! The Sphero products did not disappoint, and soon the whole family got into the act. Once we downloaded the Sphero Edu app, were were able to communicate with the Sphero BOLT via Bluetooth SMART. Believe me, we are not techies and this app makes it very easy to understand the basics of computer programming. 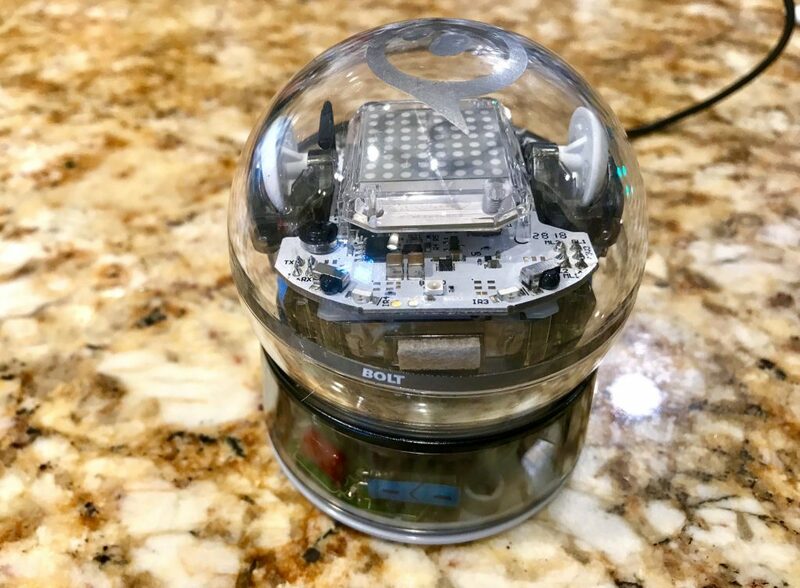 Partly intuitive, the programming of Sphero BOLT is a learning opportunity right off the bat. We were quickly able to enable the device to perform a variety of functions. 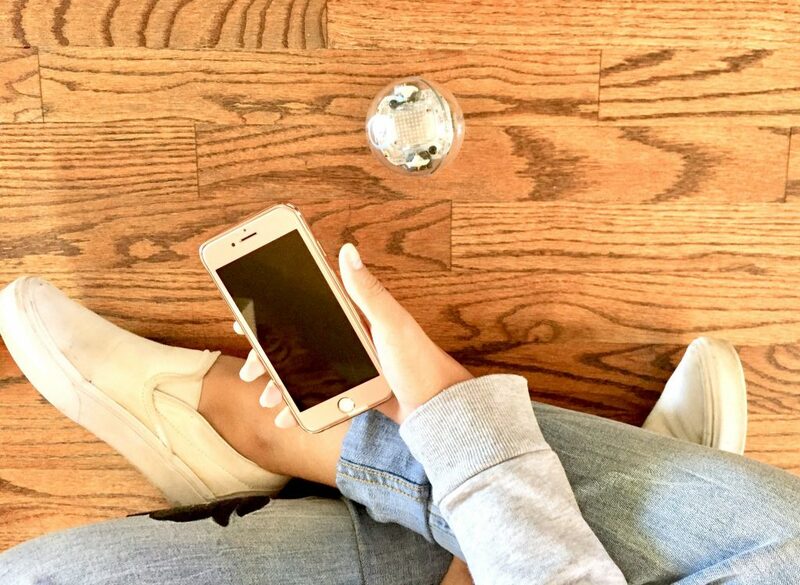 So easy to control from the Sphero EDU app on her phone, Sophia plays with the Sphero BOLT. One game we played is called Flags of the World. Sections of code are easily labeled for users to see what each will cause the Sphero BOLT to perform, simply by dragging and dropping these sections into a block. When ready, we initiated the sequence and the Sphero BOLT displayed the flag of a nation while my iPhone narrated content about that country. 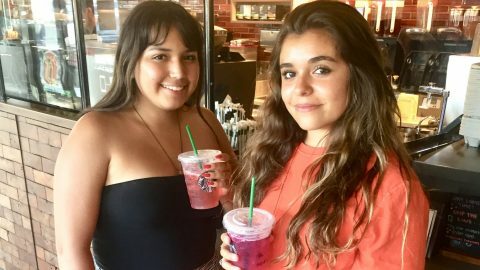 Super interesting and fun way to learn global geography and factoids – kind of like social studies, world history and coding courses all combined into one. Even the charging station for the Sphero BOLT is super cool. Even the charger is high tech, with a magnetic base that holds Sphero BOLT in place as it charges through a simple fire wire connection. The Sphero Mini is a smaller, lighter version of the Sphero BOLT. 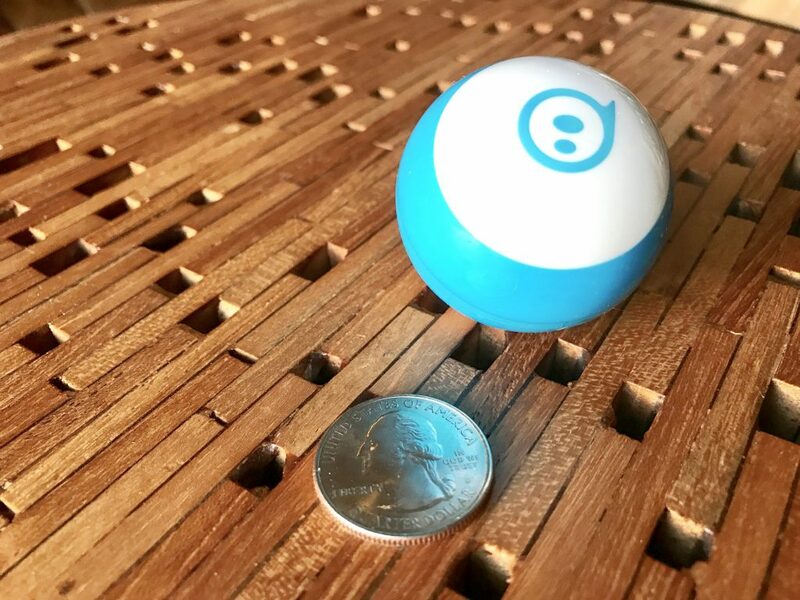 About the size of a ping pong ball, the Sphero Mini is a tiny, app-enabled robot we can control with the same Sphero EDU app. On the app, we just choose Sphero Mini, and then we are off and running with games galore. There are also a ton of games to play on the Sphero Mini. We can use the ball to simulate a bunch of different scenarios, including space travel. 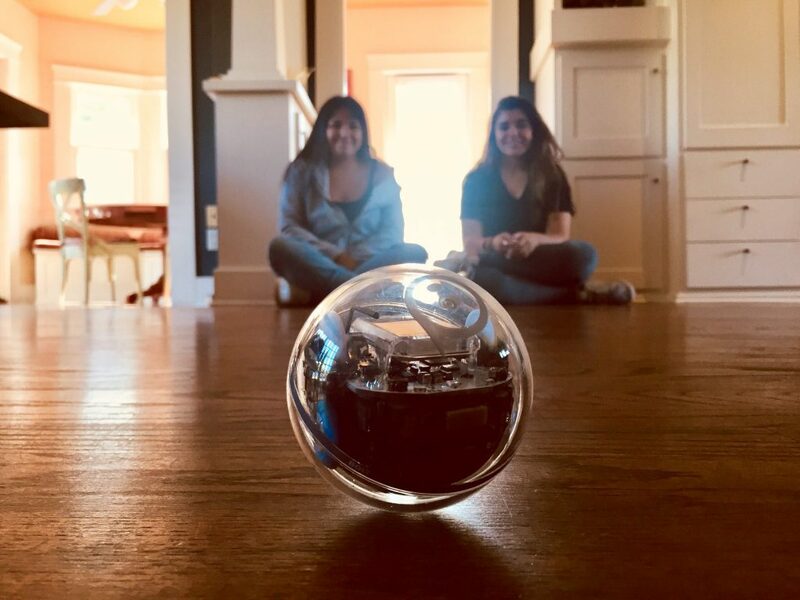 Right now our kids are more drawn to the Sphero BOLT, so we haven’t had as much play time with the Mini to truly discover all of its attributes. More to come on that! Just like the Sphero BOLT, the Mini has a tiny gyroscope, accelerometer, and LED lights that blink and change colors. We can also buy colorful, interchangeable shells, easily switching them out to suit our tastes or moods. Right now, our Mini has a blue case and I kind of like it. 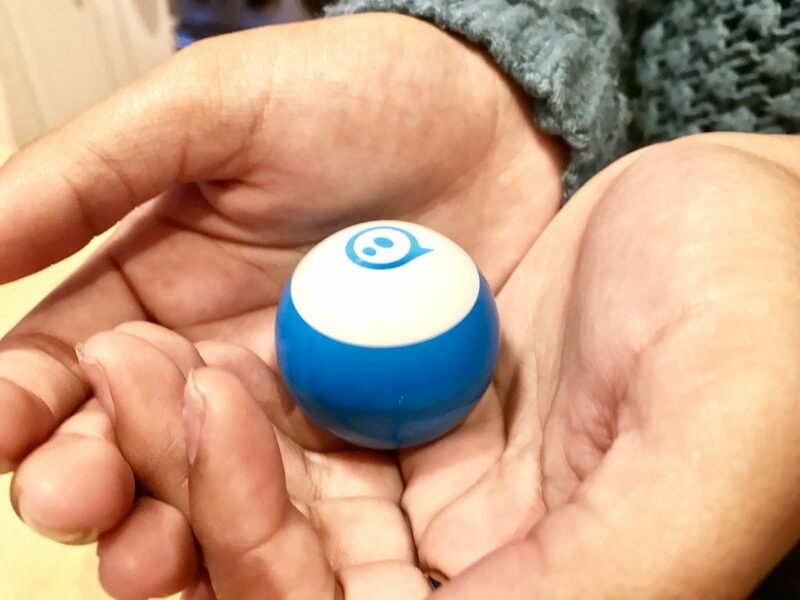 The Sphero Mini fits in the palm of Sophia’s hands. I totally think this is an educator’s dream, and the Sphero BOLT and Mini will start to show up in school classrooms soon. Because they are so fun and engaging, these devices can keep kids’ attention longer than anything. (Truth be told, I’m just a big kid and I played the the Sphero BOLT for hours!) The Sphero BOLT also features infrared communication, allowing our robot to “communicate” with other BOLTs. When paired or grouped, the devices can play brand new games that involved group coding activities. Equipped with Bluetooth SMART and a durable, waterproof shell, Sphero BOLT is such a fun new way to learn and play. 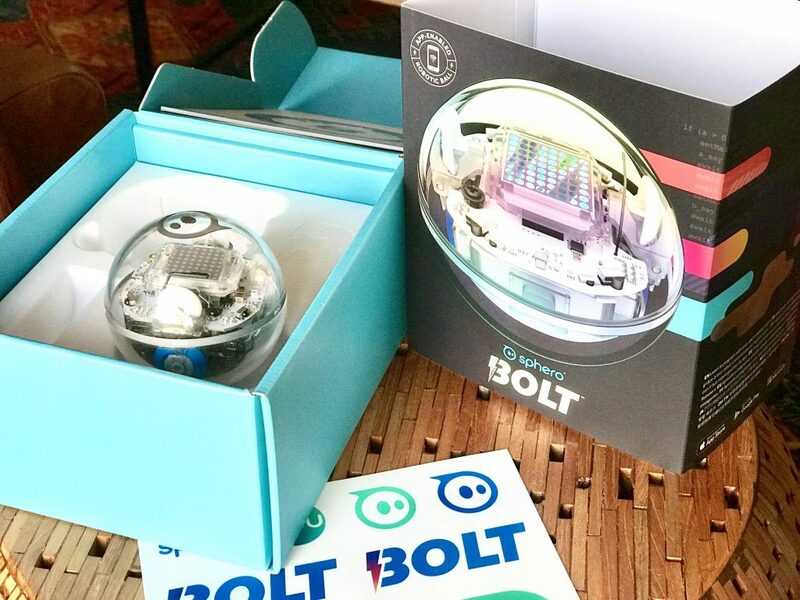 When we unboxed the Sphero BOLT, the packaging was almost as cool as the tech. I must admit, we laughed pretty hard when our dogs first encountered the Sphero devices. They did not quite know what to do or what these robots are, so they sniffed them and then observed them in amazement. (Kind of like we did!) At first they tried to chase them a little, and then we programmed the Sphero BOLT to chase THEM. The literally ran backwards from the balls as they moved towards them. Our dogs are pretty smart, so maybe we can teach them coding too and they won’t be scared of our new robots!